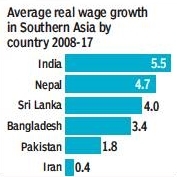 Globally, the rate of growth in wages in 2017 fell to its lowest level since 2008, but workers in India had the highest average real wage growth in Southern Asia of 5.5% over the period 2008-17. At the same time, India and Pakistan had the dubious distinction of having the highest gap between what men earn and what women do. The mean gender pay gap of 34.5% for India and 34% for Pakistan on the basis of hourly wages were the worst among 73 countries for which data was available. Globally, women continue to be paid about 20% less than men. Not surprisingly, the gender gap in wages was lowest in high income countries and highest in low and middle income countries. 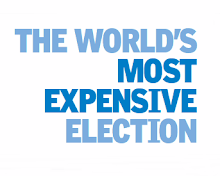 These were among the findings of the Global Wage Report 2018 brought out by the International Labour Organisation. Globally, growth in wages in real terms (that is, adjusted for price inflation) declined from 2.4% in 2016 to just 1.8% last year, far below the level of 3.4% before the global financial crisis. If China with its huge population and rapid wage growth were excluded, the global real wage growth would be just 1.8% in 2016 and 1.1% in 2017. The slowdown in wage growth in 2017 occurred in spite of more rapid economic growth. Workers in Asia and the Pacific have enjoyed the highest real wage growth among all regions over the period 2006–17 with countries such as China, India, Thailand and Vietnam leading the way. However, even here, wage growth in 2017 was lower than in 2016, falling from 4.8% in 2016 to 3.5% in 2017. Again, if China were removed, the growth would be even lower. Over a longer period, 1999 to 2017, real wages have almost tripled in the emerging and developing countries of the G20, while in advanced G20 countries they have increased by just 9%. Yet, in many lowand middle-income countries, average wages remain low and insufficient to adequately cover the needs of workers and their families, pointed out the report. According to the report, gender pay gap is wider at the high end of the pay scale in high-income countries, while in low- and middle-income countries the gender pay gap is wider amongst the lower paid workers.